Experience intensive learning with an evolutionary type of natural horsemanship (non-resistance training – click for more info ) in our intensive horsemanship courses. Develop a better understanding and way of communicating with horses based on equine body language, psychology, and biomechanics. 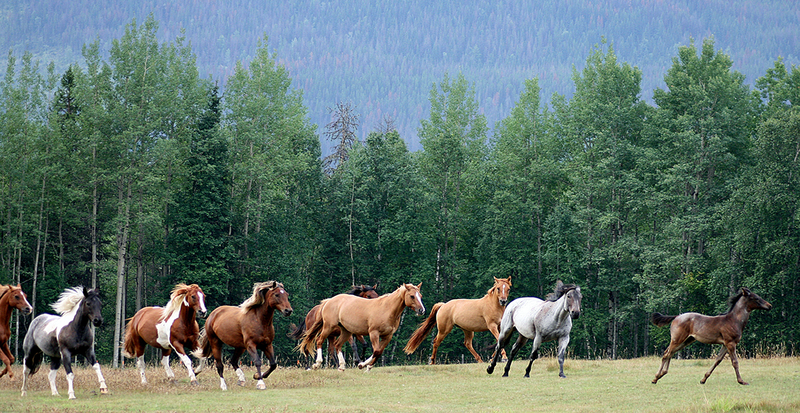 Accelerate your horsemanship and watch your confidence soar in the breath-taking mountain setting of north-eastern British Columbia with top Irwin Insights instructor Birgit Stutz, an Irwin Insights Level 4 Master Certified Trainer (first Irwin Insights Trainer in Canada to be awarded Level 4 Master Certification). Our intensive horsemanship courses are a great opportunity for dedicated equestrians, including those wishing to achieve Irwin Insights Master certification or take their Master certification to the next level. Birgit has coached over a dozen students to certification with Irwin Insights, as well as numerous students to levels eligible for certification. Our intensive horsemanship courses have been developed with and are endorsed by Chris Irwin/Irwin Insights. Birgit’s passion for coaching, her extensive knowledge and attention to detail will take your horsemanship to a level far beyond your expectations! We’d also be happy to set up a intensive horsemanship course during other dates than the ones listed on the events page if you have a group of six people interested. Each course curriculum is designed based on the individual participants’ experience and goals, but will include various ground work exercises such as round penning, lunging, long-lining/ground driving, in-hand work, riding lessons with horses of various training levels, as well as theory sessions on equine behaviour, psychology, and biomechanics. Birgit will teach you how to proactively work with horses and help you improve your body position and timing, as well as your awareness of the horse’s rhythm and bend, further enhancing communication with the horse and thus helping the horse become more confident, more willing, more responsive, more relaxed, softer and more focused. As there are usually a variety of training horses at Falling Star Ranch Academy of Foundational Horsemanship, students also get the opportunity to watch Birgit’s training sessions with young horses and horses with “issues”, and depending on the participant’s skill level, he/she may also work with client horses. Specific topics such as trailer loading, how to handle behaviour problems such as biting, bucking, rearing, spooking, bolting, aggression, difficult to catch, difficult to handle feet, not standing for mounting, head shyness, difficult to bridle, etc., may also be addressed, either in theory sessions or in hands-on sessions. A big focus will be on teaching the student how to properly diagnose the cause of the issue and the knowledge and skill required to address cause rather than symptom by giving the student the opportunity to practice this by working on horses with issues under Birgit’s tutelage. The student will be able to take this powerful ability to diagnose a wide range of problems with him/her, and allow him/her to continue to improve after the student leaves Falling Star Ranch Academy of Foundational Horsemanship. Correctly diagnosing the issue and dealing with the cause rather than the symptom is what sets the method of Irwin Insights apart from other horsemanship methods. Students will have access to Falling Star Ranch Academy of Foundational Horsemanship’s extensive library consisting of training videos, DVDs, books and articles for studying purposes. 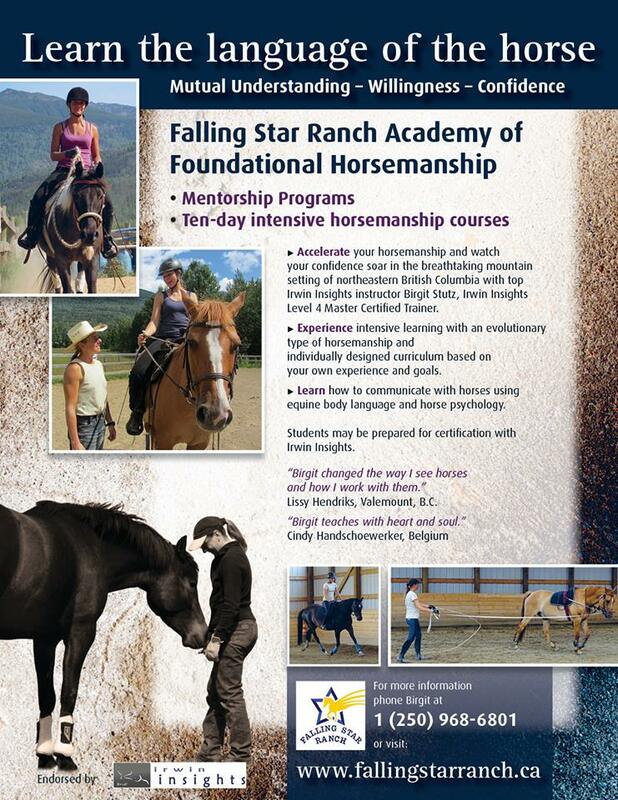 Falling Star Ranch Academy of Foundational Horsemanship provides all the horses for the intensive horsemanship courses. You may be working not only with Falling Star Ranch owned horses but also with client horses, depending on your skill level. Our horses are not the usual type of lesson or dude horses. They are well trained and responsive, and are ridden by experienced riders on a regular basis. Through careful training, the horses are allowed to keep their own personalities and stay sensitive and responsive, giving you immediate feedback, instead of being shut-down and dull and just putting up with whatever the rider/handler asks them to do. Birgit believes strongly that every horse is an individual and that the secret to unlocking its full potential is reached by putting the needs of the horse ahead of the handler/rider in every context. By doing so she has many times produced amazing changes in horses and as a result in their humans too. Our horses are all kept in groups outdoors year-round, and through their natural keeping they are very alert and sensitive. They are wonderful teachers! If you would like to bring your own horse, please check for health requirements and availability of space. Falling Star Ranch Academy of Foundational Horsemanship’s facilities include a beautiful 60′ x 120′ indoor riding arena (built in 2013), a 65′ x 140′ outdoor riding arena with a breath-taking view of the Rockies and Cariboo Mountains, as well as a 50′ outdoor round pen. Click here for more info on Falling Star Ranch Academy of Foundational Horsemanship’s facilities. We love to ride outside, but if the weather is inclement, or the sun is beating down on the sand in the outdoor arena, or the bugs are bad, we always have the option of riding indoors. Sessions run from 9 a.m. to approximately 5 p.m. weekdays (with an hour for lunch). Please note: times are subject to change. We are on horse time after all! Click here for dates for Falling Star Ranch Academy of Foundational Horsemanship’s intensive horsemanship courses! Our intensive horsemanship courses are limited to eight participants to maximize the amount of individual attention and instruction that each student receives. Participants must be at least 18 years old, or 16 if accompanied by a parent. Come join other like-minded horse people for this incredible educational opportunity of learning new horsemanship skills and non-resistance training methods taught by a top Irwin Insights trainer in a relaxed and enjoyable atmosphere in a beautiful environment. Students may stay on as mentees or working students at Falling Star Ranch Academy of Foundational Horsemanships and further develop their horsemanship skills. A working student position is however NOT guaranteed upon completion of an intensive horsemanship course at Falling Star Ranch Academy of Foundational Horsemanship and depends on availability of working student positions and skill level of the applicant. Participation in an intensive horsemanship course at Falling Star Ranch Academy of Foundational Horsemanship does not guarantee that the student will receive certification from Chris Irwin (Irwin Insights) and depends on the skill level of the participant. Evaluation for skills certificates is available via videos (for a fee) for students working towards Irwin Insights Certification. Certification clinics with Chris Irwin take place in Canada (Alberta, British Columbia, and Ontario), United States, Belgium and in the Netherlands. Chris Irwin’s clinic schedule is available at www.chrisirwin.com at the beginning of each calendar year. Falling Star Ranch Academy of Foundational Horsemanship usually hosts one or two certification clinics with Chris Irwin per year as well, and we try to time it so it is right after a horsemanship course. Please contact us for registration form and fees. Accommodation is not included in the horsemanship course. Students may bring a camper or tent and stay directly at Falling Star Ranch (limited availability of camping spots). Please be aware that there are no public washrooms (except an outhouse) and no public showers available at Falling Star Ranch. Limited hook-ups for power are available at $25 per day. Please bring your own drinking water as we have to haul our drinking water. Wireless internet and cell phone reception is available at Falling Star Ranch. The closest payphone is located 10 km from the ranch at the Dunster General Store. There is also a simple campground (no hook-ups) minutes from the ranch along the beautiful Fraser River. Simple campsites (no hook-ups) are also available at the Dunster school (availability of showers and Wifi, and next-door to the Dunster general store). There are also several hotels, motels, cabins and bed and breakfasts in nearby Dunster, McBride and Tete Jaune (click here for recommendations or send us an email – some of them offer special rates for our students! Transportation to Falling Star Ranch Academy of Foundational Horsemanship from accommodations in Dunster and McBride may be arranged. Please check with us beforehand. We also have bikes available for rent. Meals are not included in the intensive horsemanship course. Students are responsible for all their own meals and refreshments. Bottled water, juice boxes, cookies, granola bars, fruit and popsicles are available for purchase at the ranch. In consideration of our own pets, we ask that you leave your pets at home. There is the option of boarding pets at a local kennel in McBride. Visit Robson Valley Pet Hostel for more information.